After the event’s huge success in the past six years, Over The Edge presents its seventh annual fiction slam with Featured Reader, Aiden O’Reilly, at The Kitchen @ The Museum, Spanish, Galway on Friday, October 16th, 8pm. Aiden O’Reilly’s short story collection Greetings, Hero was published by Honest Publishing UK in 2014, and launched in London and in Dublin. Aiden lived for nine years in Eastern Europe. He has worked as a mathematics lecturer, translator, building-site worker, and sub-editor for a property magazine. His fiction has appeared in The Stinging Fly, The Dublin Review, The Irish Times, Prairie Schooner, 3am magazine, Unthology 4 and in several other anthologies. His plays have been given professional staged readings at The Triskel in Cork, and in Dublin. He won the biannual McLaverty Short Story Award in 2008. In 2012 he received a bursary from the Arts Council. 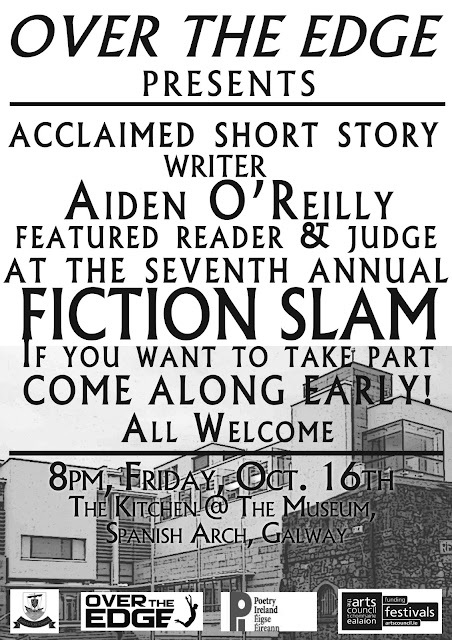 The first twelve fiction writers to make it to The Kitchen @ The Museum on the evening of Friday, October 16th and register will be guaranteed a place in the slam. If you want to be sure of a place, get there early! All participating writers should bring two pieces of their own fiction, as there are two rounds. The time limit in both rounds is five minutes. Extracts from longer stories are admissible. Stories do not have to be memorised. The Fiction Slam will be judged by a three person jury made up of two audience members and Aiden O’Reilly. Three writers will go through to the second round and the prize for the winner is a bottle of wine. There is no entrance fee. All welcome. For further information contact 087-6431748. Over The Edge acknowledges the ongoing generous financial support of the Arts Council, Poetry Ireland and Galway City Council.